In line with the SDGs, multisectoral action (box 1) is a key action area of the Global Strategy for Women’s, Children’s and Adolescents’ Health.2 It is central to other global health priorities, for example, universal health coverage, the prevention and control of non-communicable diseases, and the “health in all policies” approach.345 A fundamental question arises: could the transformative changes envisioned in the SDGs be achieved by each sector acting independently, or do they require multisectoral collaboration (see box 1 for definitions)? Stakeholders are actors, whether individuals or groups, who can influence or be affected by a particular concern, process, or outcome.6 Stakeholders may include governments, non-governmental organisations (NGOs), civil society, private actors, international organisations, donors, service users, service providers, the media, and other groups. Independent action: individual sectors independently undertaking their core business and advancing their own sectors’ goals; in so doing they can also contribute to other sectors’ goals. For example, health sector investments in children’s health could also improve educational performance, and better health and education could contribute to higher productivity and wages in adulthood. Intentional collaboration: multiple sectors and stakeholders intentionally coming together and collaborating in a managed process to achieve shared outcomes. This is referred to in this paper as multisectoral collaboration. In the context of the SDGs, shared outcomes of multisectoral collaboration could include joint programmes for poverty reduction, better health and wellbeing, high quality education, improved nutrition, gender equality, economic growth, and other outcomes influencing health and sustainable development. Contextual, ecological interactions: there are individual, social, and environmental factors, beyond the remit of any sector, that intersect with and influence sectoral work. For example, individuals’ biology and behaviours, sociocultural norms, political ideologies, and environmental phenomena. Sectors independently and collaboratively could seek to tackle how these matters influence implementation and impact. To contribute to the evidence, the Partnership for Maternal, Newborn, and Child Health (PMNCH) supported the development of 12 country case studies. These were selected from responses to a global call for proposals, using weighted selection criteria. Each country case study relates to one of six thematic priorities on which PMNCH and other Every Woman Every Child (EWEC) partners agreed to focus on for 2018-2020 to support country implementation of the global strategy.16 Since the call for proposals intentionally focused on health and partnership across sectors, all the country case studies related to SDGs 3 and 17; other SDGs were covered based on the context of the multisectoral collaborations (table 1). The papers in this series show diversity in the selected case studies—in relation to country income level, the type and number of sectors and stakeholders involved, breadth of scope from sub-national or pilot programmes to those at scale, and the time span. Some, for example, began as non-governmental organisation (NGO) led pilots implemented in remote rural areas and were scaled up to national coverage; others were initiated by a president or prime minister and rolled out nationwide over a matter of months. A few were established more recently and for a finite period to accomplish a specific goal; and several are ongoing and open ended, with the longest running since 2002. We present a synthesis of the country case study findings, and develop a multisectoral collaboration model to inform further policy, action and research. We anticipated that development of an underlying theoretical basis or model would be helpful in informing action and further development in relation to multisectoral collaboration.17 Our model development used a combination of methods, incorporating narrative synthesis17 and a multi-grounded theory approach.18 This combined approach goes beyond summarising findings to synthesise higher level interpretive findings and systematically develop a theoretical model. Three main steps were employed to synthesise the country case study findings and develop a multisectoral collaboration model in this paper (supplement 1): conducting preliminary analyses of the country case study findings; synthesising higher level, interpretive findings with reference to a theoretical model; and assessing the robustness of the higher level, interpretative findings and the multisectoral collaboration model. The literature review that informed the case study methods guide identified key components of multisectoral collaboration.1419 The semi-structured questionnaire in the study series methods guide19 provided a template from which to extract, categorise, and analyse the findings from each country case study. To accommodate the specific higher level findings across the country case studies on what works in multisectoral collaboration, we adapted the reference theoretical model (supplement 1, fig 1). Assessing the robustness of the higher level, interpretative findings and the multisectoral collaboration model. To accommodate the specific findings on multisectoral collaboration, the reference model was adapted both thematically and graphically (supplement 1, fig 1). This process continued until “theoretical saturation” was reached: that is, when the components of the new multisectoral collaboration model could accommodate all the case study findings without needing further adjustment.17 Robustness was also assessed by triangulating case study findings from different countries, and by drawing on multidisciplinary perspectives in the literature. The global steering committee and country teams reviewed the model and interpretive findings and confirmed that these reflected their experiences and lessons learnt. Expert peer reviews further confirmed the robustness of the interpretive findings and model, identifying congruence with evidence from health and other sectors, as highlighted in the discussion section below. Supplement 1 includes more details on considerations on the quality of the methods and analysis. The multisectoral collaboration model (fig 1) synthesises findings across the case studies on what works in multisectoral collaboration. In the model, “Drive change” includes a range of actors and factors that identify a need for, and initiate, a multisectoral collaboration. “Define,” “design,” and “realise” are deliberate, coordinated actions taken by sectors and stakeholders to tackle the identified need. Multisectoral collaboration is supported by the central component—“relate”—which includes the collaborative relationship as well as the integration of evidence, norms, and innovation in relation to all the different components. “Capture success” refers to how the collaborations define success and measure the results achieved. 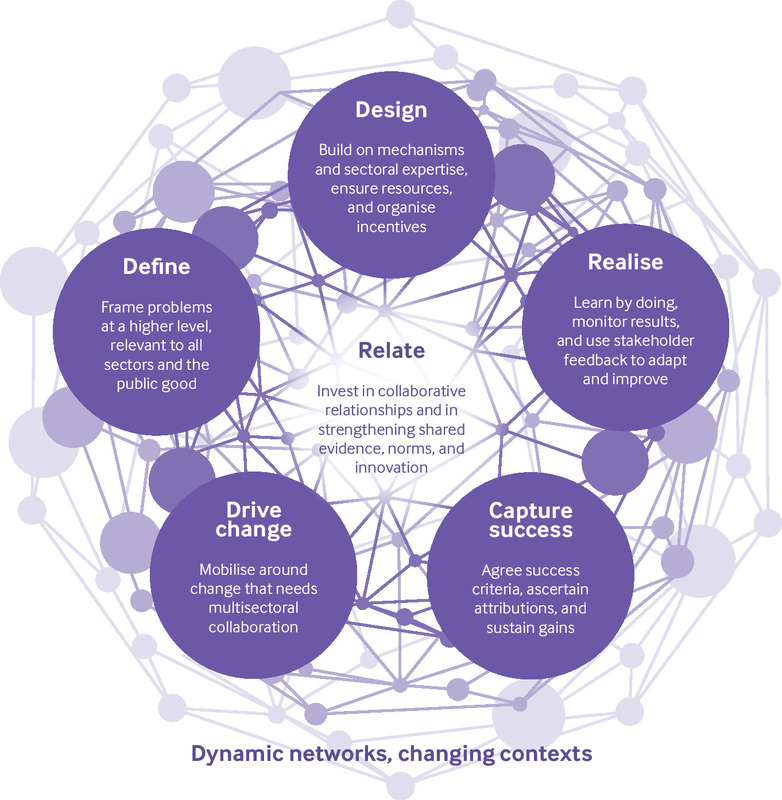 All six components in the model occur within a broader context of ongoing interactions and changing social and environmental contexts, and create a new force for collective action, learning, and change. We elaborate on the six components of the multisectoral collaboration model, with higher level interpretive findings and illustrative country examples. All the multisectoral collaborations presented in this series sought to disrupt the status quo positively by instituting “business not as usual.” Across the case studies, drivers of change included a range of challenges or opportunities such as legislative, political, or socioeconomic changes, including the transition from low to middle income country status. In some cases, new data played a role by revealing a problem or gap; in others, scientific advances and innovation brought new possibilities for change. Media coverage and public attention often played an important part in instigating action, as did demands by stakeholders for harmonised policies and programmes to achieve common goals. In some countries, a high level “champion” was willing and able to kick start the collaboration and drive it forward. Multisectoral collaboration being complex and requiring significant coordination and resources, stakeholders in all cases had to assess whether this was a better way to achieve the desired changes than reliance on action by an individual sector (box 2). Germany: For more than a decade, Germany has been making a concerted effort to ensure all children grow up healthy and safe. Germany’s Early Childhood Intervention programme supports nationwide goals of providing equal opportunities for all children to develop to their full potential. The programme includes cross sectoral collaboration as a central component, particularly between the social services sector and the health sector. Efforts contribute to nationwide support for cross sectoral networks supporting early childhood intervention, such as family midwifery and nursing services, and are part of a long term focus to ensure children grow up healthy and safe, particularly for families living in difficult circumstances. Guatemala: After more than a decade of post-war reconstruction, inequities in the levels of maternal mortality between indigenous and non-indigenous women remained stark, indicating that the health system was not adequately meeting the needs of indigenous women. One study found that a large portion of ethnic differences in the use of institutional delivery services between indigenous and non-indigenous women was attributable to indigenous women not speaking Spanish. This study and a 2015 health systems assessment for Guatemala indicated additional challenges with availability, accessibility, and quality of services for indigenous women. India: India’s immunisation programme is the largest in the world, with annual cohorts of around 26.7 million infants and 30 million pregnant women. Despite steady progress, routine childhood vaccination coverage has been slow to rise, with an estimated 38% of children failing to get all basic vaccines in the first year of life in 2016. Once a decision to engage in multisectoral collaboration was taken, the situation was strategically defined and framed so that all sectors and stakeholders could see their role and contribution to a common goal. Attention paid to defining the problem also influenced the type of solutions sought and the measures of success; “a problem well-put is half solved.”20 In most cases the matter was framed in terms of overarching societal goals and values: for example, the human rights of indigenous communities, the agency and power of girls and women, and overcoming inequities in access to health and social services. In some countries the problem was further structured in more technical terms: for example, based on a specific health or sustainable development outcome, a service coverage gap, or the socioeconomic benefits of tackling a challenge (box 3). Chile: A survey in 2005 found that 30% of Chilean children under the age of 5 were not reaching developmental milestones, with wide gaps between rich and poor. Drawing on these survey results, Michelle Bachelet, a paediatrician and the first female president of Chile, set a goal to ensure optimal development for all children, regardless of background, origin, and socioeconomic status, by breaking the intergenerational cycle of poverty and reducing inequity. Malaysia: The government of Malaysia approved funding for a multisectoral effort to support a human papillomavirus (HPV) immunisation programme for girls and significantly reduce the incidence of cervical cancer. Prior to this, the cervical cancer screening programme had failed to achieve screening targets. There was increased political and public interest in the matter because of media stories about the illness and death from cancer of the prime minister’s wife. There were also concerns that the vaccine could promote sexual promiscuity, be harmful to health, or not meet Islamic requirements. South Africa: The South African government is increasingly concerned about the high rates of new HIV infections among adolescent girls and young women. It recognised that several social and structural factors underpinned this problem: poverty; unmet need for health and social services, including through educational institutions; gender inequality; and alcohol and substance abuse. The solutions sought to the problems tackled by multisectoral collaboration were designed to build on existing structures, making innovations and adaptations for specific contexts. This process drew on diverse expertise from different sectors, and on feedback from stakeholders, to enhance relevance and impact. Although the design phase was often led by topic experts, the participation of stakeholders, including service users and the general public, was crucial. The feedback of service users in particular helped ensure the acceptability and perceived value of the designed solution. Ensuring sufficient resources, for both the programme activities and the management of the multisectoral collaboration itself, was a critical concern. In some countries the coordination of multisectoral collaboration was funded from the outset. Others started with seed funding. Across all the case studies, transitioning a project into an institutionalised programme with predictable (often government) funding was a desired objective. Designing mechanisms for regular, open communication among the multisectoral collaborators was also emphasised in many of the case studies (box 4). An enabling factor for collaboration in this phase, particularly when scaling up, was finding the optimal balance between national level standardisation, support, and quality assurance on one hand, and the flexibility to adapt to local needs on the other. For example, national efforts for standardisation and capacity building can support local implementation. Successful local adaptations and initiatives can inform national guidance and support and be shared or scaled up across a country. The “realise” component is an iterative process, often needing collaboration to redefine or redesign its planned action, or a component of it. This might be because of changes in the sectors or stakeholders involved, whether individuals or organisations. As the case studies show, these changes are sometimes planned, sometimes organic, sometimes initiated by an external or internal factor, and sometimes unanticipated (box 5). Afghanistan: Decades of war and instability had left most people without access to primary health services. In response, Afghanistan’s Basic Package of Health Services (BPHS) was introduced in 2003 at the primary care level and is an example of an innovative multisectoral collaboration implementing, scaling, and iteratively refining health service delivery in a poor, post-conflict crisis setting. Relationship building is central to all multisectoral collaborations. Investment in collaboration mechanisms enables open and regular communication, and facilitates the mutual understanding, trust, and accountability needed to achieve shared goals. Also important are mechanisms for all stakeholders to provide feedback throughout the process, to inform any adaptations needed. Aligned with a collective logic of inquiry,20 multisectoral collaboration enabled diverse evidence and ideas to be tested, and encouraged innovation to tackle long standing constraints and achieve greater impact. Norms and values were interlinked with evidence as an explicit consideration in the case studies, particularly in terms of respecting positive sociocultural norms, shifting away from harmful norms, or developing and formalising new norms, for example, through standards, guidance, or official agreements. Multisectoral collaboration is a dynamic process that occurs within wider interactions and networks and changing political, social, and environmental contexts (figure 1). Different stakeholders were more or less strongly engaged at different stages in the collaboration, depending on their roles, which were defined more or less formally. In some cases, a cross cutting coordination function—through, for example, ministries of planning or finance—was helpful to connect specific technical sectors and engage a wide range of stakeholders. A shared sense of identity in multisectoral collaboration often developed in response to a specific context, including the ability to learn, adapt, and evolve in response to ongoing developments on the ground. Global and regional stakeholders’ contributions were also valued, especially in times of crisis and to tackle shortfalls in technical capacity or resources. Nevertheless, across the case studies, three common components of success are evident: a contribution to health and sustainable development goals, including benefits perceived by service users; success within the collaboration in terms of strength of relationships, innovation, and incentives; and the scaling up and sustainability of the effort. These components highlight a common view that multisectoral action is valuable for both the means and the ends achieved. The positive results reported by the case studies, however, need to be considered with caution. Two critical caveats are the self defined nature of the successes and the extent to which they are directly attributable to multisectoral collaboration (as a standard intervention), given the diversity of contexts and collaborations. For example, the studies did not involve comparison with populations who were not exposed to multisectoral collaboration, and few had pre-post measures. Nonetheless, based on evidence of improvements in processes and intermediary outcomes,1738 plausible assumptions can be made about the potential positive contribution made by the collaborations to health and sustainable development outcomes. Capturing success also requires learning from failure and adaptation to challenges and change. In some cases, collaborative relationships took longer to establish because the problem was not framed in a way that all sectors and stakeholders could see the benefits of working together. This often required several iterations. The lack of engagement of key stakeholders and experts in relevant programme components reduced the ability to coordinate action and to adapt—for instance to tailor services appropriately for high risk groups and local circumstances. It also led to delays in the transition to scaling up or government ownership of programmes. The multisectoral collaborations faced a range of ongoing or new challenges which required adaptive and innovative responses, as highlighted in “realise.” Adaptive strategies included raising additional funds to meet financial shortfalls; collaborating with media to increase public awareness of, and support for, the programme; strengthening systems to support multisectoral services; and regularly monitoring and responding constructively to changing political, demographic, and social changes, including emergency situations. Despite the case studies being heterogeneous in terms of their geographic, economic, social, cultural, and historical contexts, strong similarities were identified in how multisectoral collaborations were initiated, managed, and taken to scale (figure 1). These higher level findings and shared lessons allow governments and other implementers to showcase their achievements and learn from real world experiences of how multisectoral collaboration works. We provide new insights into the dynamics and effects of multisectoral collaboration. Multisectoral collaboration is not a constant configuration,23 but a dynamic and evolving process, during which stakeholders and their engagement may change across different components and contexts of the collaboration. The collaborations were intentional new modes of collective action that generated new learning and new ways of working as they evolved, to achieve transformative results. Stakeholders strategically framed a challenge or opportunity that all sectors could relate to and explicitly deliberated on the evidence, norms, and innovation needed to shape all components of the collaboration. Collaboration across the case studies show three common elements of success: contribution to health and sustainable development goals; collaborative relationships, innovation, and incentives; and scaling up and sustainability of the effort. More studies are needed to further define success for multisectoral collaborations and strengthen measurement. The case studies’ findings offer plausible associations for the positive results of multisectoral collaboration. These should, however, be interpreted with caution given the limitations in measurement, comparability, and attribution, especially with regards to health and development outcomes. There are challenges in demonstrating and attributing direct impacts of multisectoral collaboration as an intervention. Research and evaluation in this area is needed, however, to develop and test hypotheses about the specific factors that contribute to success, which would also inform investment and practice in this area. Important areas for further work include the development and standardisation of indicators—such as on the perceived value of collaborative relationships and incentives, or on scaling up and sustainability. The case studies here focus on success stories: future efforts could focus on developing a systematic way to analyse failed collaborations and the lessons to be learned from them. Specific methods and tools (box 6) could help to apply in practice the six components of the model presented here, and facilitate testing and further development. The multisectoral collaboration model is based on the “logic of inquiry” as an overarching method.20 In addition, there are specific methods and tools to help operationalise the six components of the model. This article and the country case studies offer fresh insight into how diverse sectors can intentionally shape new ways of collaborating and learning in order to transform situations and achieve shared goals. The strategies described above contributed to incentives for the sectors involved, and for the public good. The multisectoral collaboration model which has emerged from this paper is relevant for other partnerships and collaborative efforts seeking to work together better and achieve positive transformative change. Capture success: agree early on markers of success. Use qualitative and quantitative methods to monitor results regularly and comprehensively. Learn from failures and successes to inform action and sustain gains. The authors thank all of the broader PMNCH Multisectoral Collaboration Study Group comprising the country teams and stakeholders who contributed to the development of the case studies within this Series, and on which this synthesis paper is based. Many colleagues contributed to the development of the methods and selection of the case studies, including Laura Frost, Beatrice Halpaap, Beth Ann Pratt, expert reviewers of eligible proposals received from the call for proposals, the United Nations H6 Working Group, and members of the PMNCH Secretariat. The authors also appreciate contributions by colleagues who reviewed and provided advice on the paper, including PC Abraham, Philipp Dorstewitz, Nicholas Furtado, Anna Rayne, and John Reeder. The paper greatly benefited from the BMJ peer reviewers, Karen Daniels, Evelyne de Leeuw, and Purnima Menon, who provided valuable direction to finalise the paper and highlighted related findings across sectors, and the BMJ editors, Paul Simpson and Emma Veitch whose guidance throughout the process was invaluable. Contributors and sources: SK and WG as co-chairs of the global steering committee, together with RH the project coordinator, and inputs from all authors, conceptualised and coordinated the development of the multisectoral collaboration case studies and synthesis paper. SK, RH, WG, JMM, JFV, RB, and DH conducted the synthesis of case study findings. Other global steering committee members (TB, NC, RC, PF, SP, KR, JR, KLS, PT, YV, MNW, listed alphabetically on the byline), and lead authors and consultants on the 12 country case studies (CEA, SB, CB, SNB, LB, EAC, JD, VG, MWK, HMM, JM, IR, MLR, VS, SS, HS, DU, CNV, PY, also alphabetical on byline) reviewed the findings and contributed to all drafts of the paper, including by writing sections. PMNCH provided funding to support the country case study teams, including to convene multistakeholder dialogues and for consultancy support as required. All other authors, across a range of organisations and as members of PMNCH, contributed their time and inputs to the study processes and journal article. Shyama Kuruvilla is the guarantor of the article on behalf of the PMNCH Multisectoral Collaboration Study Group. Competing interests: We have read and understood BMJ policy on declaration of interests and have the following interests to declare: RH is employed by PMNCH, which provided funding to support the country case study teams; CEA, SB, CB, SNB, LB, EAC, JKD, JFV, VG, HMM, JM, JM, IR, MLR, VS, SS, HS, DU, CNW, PY received funding from PMNCH for consultancy fees and related costs for undertaking the case study. All other authors contributed in kind to this collective effort with their time and inputs. This article is part of a series proposed by the Partnership for Maternal, Newborn, and Child Health (PMNCH) hosted by the World Health Organization and commissioned by The BMJ, which peer reviewed, edited, and made the decision to publish the article. Open access fees for the series are funded by PMNCH. United Nations General Assembly. Transforming our world: the 2030 agenda for sustainable development. United Nations, 2015. www.un.org/ga/search/view_doc.asp?symbol=A/RES/70/1&Lang=E. Every Woman Every Child. Global strategy for women’s, children’s and adolescents’ health (2016-2030). 2015. www.everywomaneverychild.org/global-strategy. World Health Organization. Together on the road to universal health coverage: a call to action. 2017. http://apps.who.int/iris/bitstream/handle/10665/258962/WHO-HIS-HGF-17.1-eng.pdf?sequence=1. World Health Organization. Time to deliver: report of the WHO Independent High-Level Commission on Noncommunicable Diseases. 2018. http://apps.who.int/iris/bitstream/handle/10665/272710/9789241514163-eng.pdf?ua=1. World Health Organization. Health in all policies: training manual. 2015. www.who.int/social_determinants/publications/health-policies-manual/en. World Business Council for Sustainable Development. SDG sector roadmaps: how to leverage the power of sectoral collaboration to maximize business impact on the Sustainable Development Goals. 2018. http://docs.wbcsd.org/2018/04/SDG_roadmap%20Guidelines.pdf. Partnership for Maternal, Newborn, and Child Health, World Health Organization, World Bank, Alliance for Health Policy and Systems Research. Success factors for women’s and children’s health study series: journal articles and country reports. World Health Organization, 2015. www.who.int/pmnch/successfactors/en.
. Addressing malnutrition multisectorally: what have we learned from recent international experience?Unicef, 2013. Global Health Insights. Case study development based on a review of the evidence: collaborating across sectors for women’s, children’s, and adolescents’ health. 2017. www.who.int/pmnch/knowledge/working-report-case-study-development.pdf. Neuman MJ, Devercelli AE. What matters most for early childhood development? A framework paper. Systems Approach for Better Education Results (SABER) working paper series. World Bank Group, 2013. Every Woman Every Child. EWEC partners’ framework for 2018-2020. https://drive.google.com/file/d/0B6F0e_DjgW1aZUVpT1hoMmpmcUU/view.
. Adding theoretical grounding to grounded theory: Toward multi-grounded theory. Int J Qual Methods2010;9:187-205doi:10.1177/160940691000900205. Partnership for Maternal, Newborn and Child Health. Methods guide for country case studies on successful collaboration across sectors for health and sustainable development. World Health Organization, 2018. www.who.int/pmnch/knowledge/case-study-methods-guide.pdf.
. Working multi-sectorally in nutrition: Principles, practices, and case studies.International Food Policy Research Institute, 2011. Dewey J. Logic: the theory of inquiry. In: Boydston JA, Hickman LA, eds. The Collected Works of John Dewey, 1882-1953. Carbondale and Edwardsville: Southern Illinois University Press.
. There is no “point” in decision-making: a model of transactive rationality for public policy and administration. Policy Sci2010;43:263-87doi:10.1007/s11077-009-9098-y.
. Taming deep uncertainty: The potential of pragmatist principles for understanding and improving strategic crisis management. Adm Soc2017. doi:10.1177/0095399717747655.
. Scaling up an early childhood development programme through a national multisectoral approach to social protection: lessons from Chile Crece Contigo. BMJ2018;363:k4585.
. Human papilloma virus immunisation of adolescent girls: improving coverage through multisectoral collaboration in Malaysia. BMJ2018;363:k4602.
. Tackling HIV by empowering adolescent girls and young women: a multisectoral government-led campaign in South Africa. BMJ2018;363:k4585.doi:10.1136/bmj.k4585.
. Adolescent girls’ nutrition and prevention of anaemia: a school-based multisectoral collaboration in Indonesia. BMJ2018;363:k4541.doi:10.1136/bmj.k4541.
. Voices for Healthy Kids: a multisectoral collaboration to accelerate policy changes that promote healthy weight for all children and adolescents in the United States. BMJ2018;363:k4763. doi:10.1136/bmj.k4763.
. Qualitative research and evaluation methods.4th ed. Sage Publications Inc, 2015.
. Analysing stakeholder power dynamics in multi-stakeholder processes: insights of practice from Africa and Asia. Knowl Manag Dev J2013;9:11-31.
. Rational analysis for a problematic world revisited: problem structuring methods for complexity, uncertainty, and conflict.2nd ed. John Wiley & Sons, 2001. H6 agencies–UNAIDS, UNFPA, Unicef, UN Women, World Bank Group, WHO. Implementation toolkit in support of the Global Strategy for Women’s, Children’s and Adolescents’ Health. Every Woman Every Child. 2016. www.everywomaneverychild.org/h6-toolkit.
. WHO, CM Partners, et al. Multistakeholder dialogues for women’s and children’s health: A guide for conveners and facilitators.WHO, 2014. Mays G. Research findings: delivery and financing systems for health care and public health services. https://health.maryland.gov/healthenterprisezones/Documents/Research%20on%20Delivery%20and%20Financing%20System%20for%20Health%20Care%20and%20Public%20Health%20Services,%20Glen%20P.%20Mays%20PhD,%20MPH.pdf.